Australian live animal exports don't have the best record when it comes to animal treatment. In 2001, Australian animal rights activists were enraged to learn that live sheep sent to Indonesia were being slaughtered while fully conscious. The fury resulted in a live shipping ban to the island nation that lasted several years. In 2012, after having been rejected by their original country of destination, 20,000 sheep were dumped in Pakistan and gruesomely killed. And in 2018, several thousand sheep died of overheating as they were en route to the Middle East. One would think, with all the controversy surrounding the live animal export industry, the companies that transport these animals would get their act together But that hasn't been the case. After the disasters in the Middle East and Indonesia comes the next wave of horror stories. This time, coming from Sri Lanka. The country has been dependent on powdered milk for years. In order to increase the supply of locally produced fresh milk, the Australian and Sri Lankan governments entered into a plan in which Sri Lankan farmers could purchase Australian "high-yielding, pregnant dairy cows." But now the Sri Lankan farmers say they've been duped into buying cows that were "overpriced, unhealthy and infertile." In fact, they claim the cows have been dying off like flies. 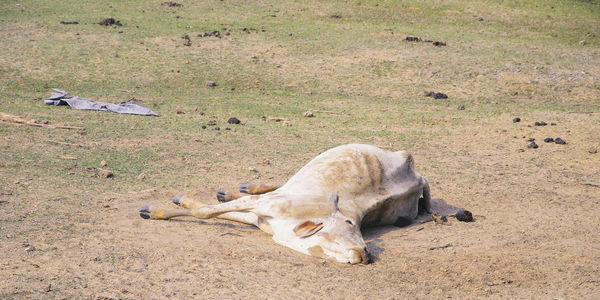 As many as 10% of the 5,000 cattle shipped so far have succumbed due to their illnesses or their inability to acclimate to Sri Lanka's climate. Wellard, the company charged with shipping the cattle dispute the farmers' numbers. They say the number of mortalities is closer to 9%. That's the difference between 500 and 450 dead cows. Either number is far too much. Wellard — like the other Australian animal exporters that have attempted, and failed, to humanely ship animals overseas — must stop shipping cattle to Sri Lanka immediately. They are not only causing the cows to suffer but the farmers who have been fooled into participating in the cow export program have also lost so much. Until these companies can figure out how to ship animals without cruelty, the current program must be stopped. Please sign the petition and ask the Australian Government and Wellard to end the program now.